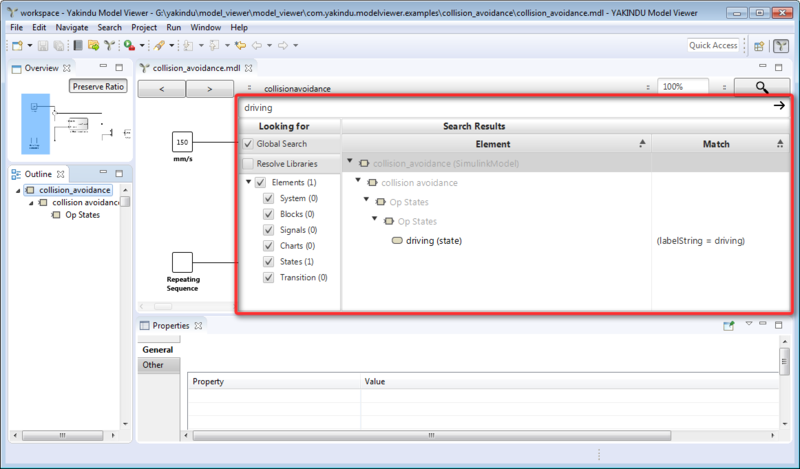 YAKINDU Model Viewer’s search functionality allows you to search for specific model elements. To start searching, click on the search button . It is labeled with a magnifying glass and resides in the top-right corner of the main view. Clicking on the search button opens the search view; see the red rectangle in figure "The seach view". Click on the search button once more to make the search view disappear. In order to actually search something, enter a search term into the text field on top of the search view, then press the [Return] key or click on the arrow on the right. The example in figure "The seach view" searches for the term driving and finds one match. The element column lists the matching elements and shows their position in the model hierarchy. Subsystems that are no direct matches, but are part of the navigation path, are shown in grey. The match column shows what triggered the match. Besides element names, the search function also checks type names and property values. The element’s name begins with the specified search string. The element’s type begins with the specified search string. At least one of the element’s property values begins with the specified search string. For example, searching for the term driving in the example shown in figure "The seach view" results in one match: a state with the name driving. Searching for driv would have given the same result, plus possibly further elements with names, types, or property values beginning with driv. Searching is done case-insensitively. That is, regardless whether you are searching for driving, DRIVING, or dRiViNg, the result is always the same. Selecting an element in the result list positions the main view to that element and highlights it. You can use the * (asterisk) character as a wildcard. It matches any sequence of zero or more characters. For example, the search term *driving would not only match the driving element, but also carefulDriving and recklessDriving. The search terms dri*ing, d*g, d*, *in*, or even * would all include driving in their respective result list, aside from possible further matches. In fact, * finds all elements in the model, unless other restrictions apply, see section "Constraining element types". On the left-hand side of the search view, you can control where the search function should look for matching elements – or where not to look. If Global search is checked, the whole model is searched for matching elements. If Global search is not checked, the search is restricted to the model element that is currently displayed in the main view and any child elements further down in the model hierarchy. If Resolve libraries is checked, the search extends to any libraries that are referenced from the model. If Resolve libraries is not checked, libraries are not searched. On the left-hand side of the search view, you can select those element types that should be included in the result list. By default, all types have checkmarks, so there’s no restriction on element types. If you want to limit the search result to specific types, uncheck the other types. The number of matches is shown in parentheses right from each model type, even for those types that are excluded from the result list. You can add them to the results by setting the corresponding checkmark. For example, the search in figure "Constraining element types" finds all states in the model.